The LG G3 screen replacement process is considered average in difficulty when it comes to high end smart phones currently being sold. Unlike LGs previous flagship phone the G2 this one has an easily removable battery cover and battery that can be replaced by the user with no special tools required. Removing the display is a moderately easy task when compared to something like the iPhone 4S. 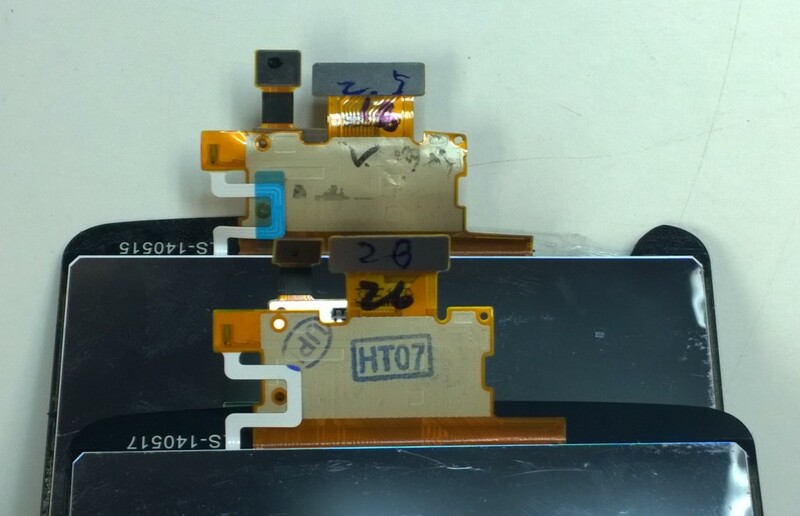 It is comparable in difficulty to Samsung's Galaxy S4 and S5 but more complex that the S5 as well as the iPhone 5 or 5S when it comes to complete LCD assembly replacement. In the video below we will demonstrate the entire process from start to finish. The replacement screen is available in three colors and can be purchased through the links further down. For tools please visit our Cell Phone Repair Tools page. For this process you should allow at least thirty minutes if you are an experienced cell phone technician. For beginners the job can take an hour or more. When working with broken screen it is a good idea to wear some form of eye protection as small pieces of glass can cause severe damage if they end up in the wrong place. Placing tape over the screen will help to minimize this hazard. A heat gun is also recommended as it makes the old screen easier to remove and less likely to break into smaller pieces. 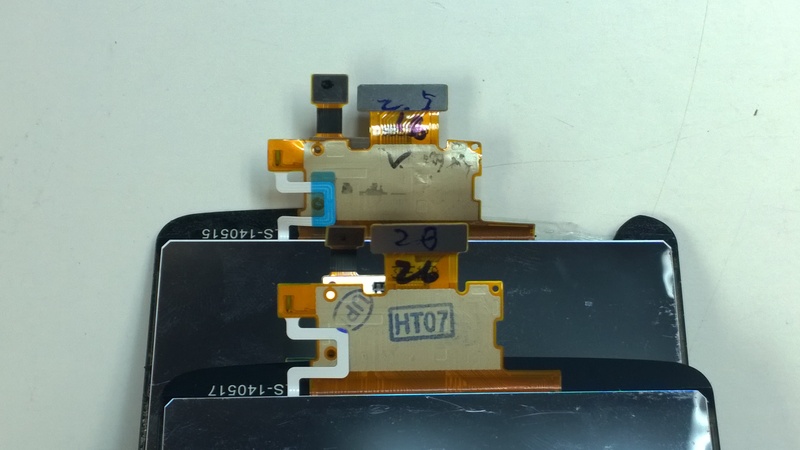 In some cases the LCD may continue to function after the glass lens cracks but in many cases the digitizer will stop working making this repair a priority for most users. While the phone can be purchased for about $199with a new contract or renewal the replacement cost with no contract is about $560 at the time of this post. This makes repairing a broken screen a good investment. Depending on the deductible cell phone insurance might be a good idea also. When replacing your screen always inspect the new part closely. It should not be missing any parts that the original has. In the photo below you can see that the blue Kapton tape from the old screen will need to be transferred to the new one. In this case the tape protects underlying contacts from grounding out against other parts of the phone. Also make sure that the metal mesh where the earpiece is located gets transferred to the new part before you install it. Without this in place the magnet inside of the speaker will attract small metallic particles over time and cease to function properly or may quit altogether. So far we have not seen anything unusual when it comes to repairing the G3. In the case of the previous model there were occasional issues with the phones LCD after it was replaced. It seems as if LG might have taken care of this problem although it could simply be an unintentional design benefit. From a users perspective this seems to be a nice phone for the price although we still hear from many people that getting used to having a power button on the back side of the phone takes some getting used to. Since most of us set our phones down face up we have to wonder whether this will have any detrimental effects to the power button. At the same time it seems as if this might help to prevent the main camera lens from being damaged since it does provide a buffer between the camera and whatever surface your phone happens to land on. Of course if you found yourself here then there is a good chance that you are already considering a protective case for your G3. We recommend the Otter box style cases as they offer the most protection. Of course this does come with a tradeoff as your phone will become somewhat bulkier when you put into this kind of case. Replacing the screen on an LG G3 this is a relatively straightforward project with a completion time of about 30 minutes to an hour depending on your skill level and experience. You should start by making sure that the phone is powered off. Flip it over and remove the battery cover. There's a small divot towards the bottom end that makes it pretty easy to pry open unlike the G2 which took a bit of force and sounded as if it was breaking when you pried on it. Next we will want to remove the battery and make sure that the micro SD and SIM card have been ejected from the phone. The SIM card is a bit tricky to get out. You might have to fool with it a little to get it started and if necessary use an object that will will give you some grip. If you're very careful you can use something sharp like an icepick and just gently slide it out down towards the inside of the battery case. From here you will remove all of the screws from the two rear panels. There's one panel at the bottom and one at the top end. There are several screws around the perimeter which are interchangeable but note that the one in the center near the the camera is a slightly different size so you don't want to mix it up with the others. It's actually shorter so putting one of the longer screws in its place might cause damage to your phone. Go ahead and get all of the screws out and be sure that you haven't missed any of them before you start prying. You can use a small pry tool and start with the soft spot down at the bottom corner. You should able to get under the panel there and just work your way around. You’ll see that the bottom one comes off without much effort and that actually makes it a little bit easier to get underneath the upper panel. You should now be able to lift that one up with your finger and then from there just work your way around the top end and the opposite side. There are several clips here that you will encounter so don't force anything as you can crack this panel pretty easily if you put too much stress on it. If you take your time and work your way around carefully it will come off without breaking. Go ahead and set the panels aside for now. The first thing that we want to do is make sure that the display we ordered is functioning properly. What we suggest doing next is taking the new part and connecting it to the phone before we remove the old screen. You'll have two pop connectors attached to the display that you can plug in temporarily. Set the battery inside and power the phone up. Check to make sure that the LCD and digitizer are fully functional. Be careful during this process as the cables are easily damaged despite having a certain amount of flexibility. The main thing you want to avoid is placing any stress on them. Once you have confirmed that the display works correctly you can power down, remove the battery, and disconnect the display. If you have questions or comments about LG G3 screen replacement please post them in the section below. I will be working on that this week. I have the original display from the video that I published so the next step will be attempting to separate the lens from the LCD. Another technician told me that it did not work out for him but I’m not sure what kind of equipment he was using. As soon as the project is completed I will post a tutorial assuming that it is successful. Hey! I saw your video on repairing the LG G3 screen and it was some good stuff. Sadly I am a school teacher and I never have enough downtime to try to attempt something like this safely. I was wondering if you did repairs for people? I have an LG G3 (D850) Silky White (AT&T). Yes we do. I have emailed you our contact information. Wondering if you can shoot me an email about setting up a screen repair. My glass is cracked but the screen itself doesn’t appear cracked or damaged – it lights up and looks fine minus the spider webbed glass. The touch portion of the screen is partially working but I’m wondering if that’s because the glass is pushing down on the touch screen itself. Thanks for your time! LG digitizers are notorious for having problems when the glass is cracked but I wouldn’t be concerned about it. The digitizer is attached to the glass so you’ll have to replace it regardless. Unfortunately we are still in the experimental stage of replacing “just the glass” on this model. I will update here when that changes. The good news is that the price for the whole display tends to drop reasonably fast for most LG phones. Hi. The top left of my screen cracked and I think it took the digitizer with it. It’s not touch responsive and I lack the skill to fix it myself. Could you guys do it for me? Yes we can. At this time we only do the entire display- LCD+digitizer+glass on the G3. With parts and installation it currently runs $160-180 depending on color and carrier. Let me know if you’d like to mail it in. i want to place an order for the lg g3 on thursday cos that’s when I’m getting the money. will it still be available on ebay as it is supposed to end on Wednesday. and also can i use hot glue instead of the double sided tape? The links are updated daily so if a listing ends there will be another to take its place. I would recommend against using glue for a number of reasons. Sometimes you have to take the phone apart again, it can leak into the wrong place and cause damage to the display, etc. We don’t have a complete kit at the moment but you should be able to find everything that you need on our tools and adhesive pages. Damage man…..my G3 is a paperweight right now. Cracked screen, light bezel damage, digitizer. Im thinking of doing this myself. How much do you guys charge for both glass and digitizer? And how fast do you guys ship out? The G3 is $149 as of today. If you need a new mid-frame/bezel you can add about $25 to that. Once we have your phone it will usually be repaired and sent out within twenty four hours. Hi so glad I came a crossed your site. I got the phone less than a month ago and the first weekend I take my bulky case off I drop it for the first time and shattered the screen on the rocks ha. Anyways I was wondering if I could get by with just replacing the glass or would I have to replace the digitizer display also. It displays and in certain spots in reponds to the double tap but it wont unlock with my code. Also there is a pressure circle around the worst crack so that makes me think I should just replace them both. Just trying to save a buck I guess if I can. Thanks in advanced and Thanks for your site. Another question. why do the prices range from 80 to over 300 when they both work for the same model number? For the G3 I would definitely replace the whole display assembly. Trying to separate the glass, buying LOCA glue and a UV lamp, etc. is a lot of work. Getting the part that is already put together is much easier and you wouldn’t save enough money to make all of the extra work worthwhile assuming that the backlight doesn’t get damaged in the process. If that happens you’d be replacing everything anyways. As far as your question concerning price most parts come as A, B, or C stock. I would assume/hope that a $300 part would be a brand new never before used screen that was pulled from an unused LG phone which was still brand new in the box. Most of the replacement screens that you will find for sale will be original LG LCDs fitted with OEM quality glass that was installed by a third party. On the other hand you will find certain people out there who will price gouge when they think that they can get away with it or if there is a part in short supply. We update our pages regularly to be sure that only reputable vendors are listed here. Hello! The glass portion of my display is shattered pretty good. The bottom left portion of the screen works okay; it still has touch sensitivity. Most of the right half of the screen however does not respond to touch. I don’t have the time and patience to do the job myself. My deductible is $175. Should I pay the deductible and have the phone completely replaced? Or would it be worth it to look for an outside repair? We charge $175 so I would assume that a shop in your area would be about the same. In my opinion it’s best to keep your own phone when it’s a close call like that. The replacement unit that you get through insurance may have issues of it’s own and you may be without a phone for a while which is never fun. I wrote a few paragraphs about cell phone insurance recently. If you’re interested you might want to take a look here. Hello. I recently dropped my sprint LG G3 on the cement and the screen shattered. The phone still works except for the screen is not touch responsive at all. Is there any way you can fix this for me? What are your prices and how long would it take for you to fix it? Please respond as soon as possible. We charge $149 to replace the G3 display. I just emailed you. Metallic black, t-mobile, G3. Small crack, top left. What is the replacement cost? Please email. My G3 cracked a while back, the screen looks ok but its unresponsive, are you guys still willing to fix it? I have a metallic Black G3 with T-Mobile. My wife dropped her silver LG g3 and the screen is now cracked and is no longer touch sensitive. I’m not so sure I trust myself fixing it. Can you fix it for us? Hi, I saw your video and was wondering if you replace mid frame chase on LG G3 F400s white? I have a hairline crack on the top microphone and what would be the cost? On the G3 it is tricky to get the display off without breaking it. Because of the liability we don’t currently offer that service. Replacing the whole display and frame runs about $170. Please send me info on having you replace the glass on an LG G3 mini. I already have the replacement glass. I haven’t come across one yet but when I do I’ll make a video for sure. The color should not matter at all for AT&T. Any of the colors on this page will work. Hi, My phone was knocked off a table on the a tile floor and cracked the screen. The screen turns on, but is unusable since the glass is pushing on it. What would it cost to be repaired? It’s a Sprint LG G3 black (but replacement color doesn’t really matter to me, it’ll be covered by a case). Right now between parts and labor about $135. I bought the screen using the above link and my husband did the replacement (he did a screen replacement on his Samsung Galaxy SII with no trouble so after watching the video, he felt he could do this one as well). He followed the video for the entire process but the screen isn’t working. Any idea what could be wrong? My first thought would be to confirm that you have the right part. If you have a GSM phone and install a Verizon screen for example then you will have problems. Second is to confirm that the cables are properly connected. If that doesn’t work then barring damage to the part or phone during installation the most likely cause is a defective part. I’d take a close look at the flexible cable connected to the screen under a magnifier. Any tears or scrapes can be a big problem. You might also find the troubleshooting page helpful. Hello friend, I wonder where I can buy screen for my LG. Thank You. Verizon LG G3 VS985 black – 2 large cracks (almost unnoticeable) in the glass. Great video, but with my fat fingers and luck I risk damaging other components! Can you replace the screen/digitizer? How and where do I send it if you do? I’m glad I ran into this post. Is everything I need found in the “US Touch Screen LCD Digitizer Assembly” kit to replace my screen (damaged digitizer as well) or will I need to purchase anything in addition to this? Send me an email with the details if you can. You shouldn’t need anything besides the tools shown in the video and possibly some double sided adhesive. Sometimes it comes with the tape built in but not always. Thanks for your help! Are all the tools in the video also provided in the kit sold on this website for 68.95? And will I need 1 mm, 2mm, or 3 mm double sided adhesive tape? Is this necessary? Can you send me an email regarding how to have my LG-G3 screen+digitizer replaced by your company? Being a beginner I feel I may end up doing more damage to the phone than actually repairing it on my own. I just had my cracked scren replaced locally and I notice the CD display is very dark now. The notification ligts are almost impossible to see. Is that normal with a replacement screen? No. I would take it back to where you had it repaired as soon as possible. Sounds like maybe a defective LCD. I have added a link for the white one that includes a new mid-frame bezel just below the links for the Verizon model. Can’t seem to find it in any other color at the moment. This is the only way I would suggest an attempt at replacing the display on an LS990 (Sprint) G3. I can’t say why for sure but changing the screen only while keeping the original mid-frame seems to run an extremely high risk of multiple problems after the repair is completed. Sometimes the phone works fine for a week or two but almost always ends up losing some sort of functionality over time. I’m not certain why the Sprint version is so special I can only tell you that in most cases we avoid this repair whenever possible. If you choose to proceed I wish you the best of luck for a successful repair. hi. i have a verizon lg g3 and just installed a second replacement screen/digitizer. i installed the first one and the phone powered up fine. but if i lock the phone by pressing the power button and then press the power button again to unlock the phone, the screen turns on for about a second and then turns off. the screen will not stay on long enough for me to enter my unlock code. i need to remove the battery each time to use the phone. i then bought from a different supplier another screen. same problem. any ideas what else could be wrong? thank you for any advice. Did you buy the display with a Verizon logo? They are carrier specific. Also if you leave anything out like the Kapton tape shown in the image toward the top of the page you may have problems. That’s all I can think of off the top of my head but I will update this is I get any new information. I have a us cellular phone lg g3. do you have any screens and lcd replacements for those? It should be compatible with the Verizon one if I am correct. What is the model number on your phone? $155 with parts and labor. Repairs are performed same day and shipping by USPS takes about 1-3 days depending on your location. I have an LG G3 (BestBuy Special Edtion) Blue model D850 At&t, Do you sell the blue replacement screen? And what would be the cost please. Not yet. My supplier shows it but out of stock at the moment. It usually takes a while to get a hold of the special edition parts. I have a White Verizon lg g3 with broken glass only. The display is fine. What would you charge to replace the glass? At this time I only do the entire display including glass, digitizer, and LCD for $120. I have an LG G3 D-852 do you have a replacement for that and if so what is the screen resolution ? I can’t confirm this since I haven’t tested that model specifically but it should be compatible with the GSM version listed at the top of the page. Could you send me your pricing and contact info to replace a Verizon LG G3 Black screen. I will be rolling out my mail in repair program after June 1st. If you can wait until then there will be a new page here with all of the pricing information and shipping how to stuff. The price for LG G3 screen replacement will be $110. I have 2 LG G3s that need screen replacements. How much would you charge to fix? Please send me an email. Hi Rebecca. The LG G3 is $110 for screen replacement. would like to send you my LG G3 and an LG G2 to have repaired…you make the repair look easy but I’m sure that is because you are good at what you do :)Thanks for posting the video and info!!! Hi Dennis. If you can hang in there for another week I will be rolling out mail in repair here sometime around June 1st. I have an LG G3 [Verizon]. The Screen is cracked — not too bad but some of the touchscreen is not responsive. Was wondering your updated prices and turn around time. Any feedback is greatly appreciated and valued. Thank you. Hi Ryan. It is currently $110 and I will add a mail in repair page here around June 1st as I will be in my new residence at that time. My LG G3 with T-Mobile has cracked. I tried to installed the replacement screen that I ordered from Amazon but it does not work properly as I cannot put my unlock code since the screen just turned on for one second then turned off . I just found out that it has to be the T-Mobile screen, am I right? Could you please advise how much for the cost if I send you my phone to replace the screen? Do you mind to fix my phone since I already did replacement myseft ? And what is your address to send my phone to? Hi Tin. I will be offering mail in repair service here starting at the beginning of June. I’d like to do it sooner but I’m moving to a new residence at the end of the month. If you can wait until then I’ll be happy to fix your phone. The LG G3 screen replacement is $110 with parts and labor. Have a LG3 that fell and shattered glass and wont turn on, Could be the digitizer , not sure. How much to fix and where are you located. I thought your LG G3 tutorial video is great so I decided to repair my screen myself. I did just like you did in the video and tested the screen before completely replacing and it worked fine. Then I put it together and that’s when it went from bad to worse. At first the LG logo came up when you powered on, then the Verizon logo (which ran very slow), then it shut down. I had t restart the phone several times to the point where the LG logo didn’t even come up. Then it wouldn’t power with the battery even though the battery was at 83%. If I connect the phone to my pc using the usb the computer will make the connection sound but will not recognize as external device. The phone will not power up with the usb, BUT if I take the battery out, the screen will become solid blue. The screen I bought is an LG screen, but it does not have the Verizon logo on it. My phone is grey, but the white face was cheaper by $15. Does it matter if it’s a “Verizon” part or not? Does the color matter? How can I legitimately determine if the part is LG or not? At this point I really don’t think it’s the screen but maybe the start up or configuration settings, maybe? Can you provide any help to fix this? The parts for this phone are carrier specific. If you put a Verizon screen on a GSM phone like AT&T or T-Mobile you might have problems like you described. usually its lines in the screen or green screen but anything is possible. If you have the Sprint version of this phone it can be a lot worse but to answer your question yes, using the wrong part can cause a lot of problems. Hi, I have a US Cellular G3 with model # US990 and cant find a lcd anywhere are they compatible with one of the others by chance? Yes the G3 screens are all listed as compatible. The only difference is what the logo says. Hi I have a lg g3 phone that has a cracked screen. The images are ok in the back but no movement or action when you touch the screen itself. Would this just need a screen replacement? Is this something that you can fix if I send it through postal mail? How much would it be? Thank you. Yes this almost always happens with a cracked screen on LG phones for some reason. I just emailed you the details regarding this repair.